So how can iPhone App Development help your business? Primarily through a new channel with which to communicate with consumers. Think of the advantages of being in a consumers pocket all the time! Whether you wish to send information about new products and services, reach out to a different audience for your business, or create a new revenue stream through a useful gadget or service, Impact can work with you to develop an innovative and robust iPhone application. Ranging from games and useful utilities to utterly frivolous applications that can encourage a new audience to interact with and talk about your brand, Impact can work with you to maximise this innovative mobile channel. With the launch of in-app payments a whole new mobile commerce channel is opening up that will allow consumers to purchase your products or services from within an application via their iPhone. 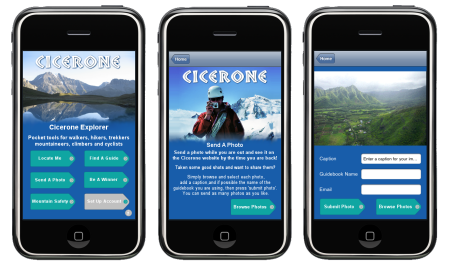 Created for Cicerone, publishers of award winning guidebooks for walking, climbing, trekking and cycle touring, the Cicerone Explorer app has been created to assist Cicerone to engage with a new target market. With a mix of useful and fun elements for outdoor enthusiasts the app provides an innovative way to widen the promotion of the Cicerone brand. 1 of 3 girls and then switch their body parts and backgrounds to create amusing (and some scary!) pin up girls. This app launched in the Apple App Store in December 2009 and is reported to have been selling steadily ever since. Whatever your iPhone development requirement Impact can assist you in bringing your idea to market or migrating your favorite applications from other smart phones to the iPhone. To help you become a part of the iPhone phenomenon contact us now to talk through your iPhone development ideas.